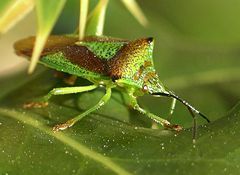 Hemiptera is a major order of insects, collectively known as true bugs, characterized by sucking mouthparts, rather than chewing mouthparts. This is a very successful group of insects, with about 80,000 species, and found in terrestrial and aquatic environments, including the only known marine-pelagic insects. Among groups included in Hemiptera are cicadas, aphids, planthoppers, leafhoppers, shield bugs, assassin bugs, bed bugs, and others. While many feed on sap and other plant material, some feed on animal sources, such as the hemolymph of other arthropods and the blood of mammals and birds. Hemipterans are vitally important as part of food chains, being consumed by countless vertebrates and invertebrates. And as one of the few and perhaps the most important insect group that has adapted to aquatic environments, they provide an important source of food for fish, and, being voracious predators, help to control mosquitoes during the mosquito's aquatic larval stage. While many hemipterans, such as aphids and scale insects, are significant pests of crops and gardens, some predatory forms serve to control agricultural pests. The defining feature of hemipterans is their possession of tubular, sucking mouthparts where the mandibles and maxillae are in the form of a proboscis, sheathed within a modified labium to form a "beak" or "rostrum." This structure is capable of piercing tissues (usually plant tissues) and sucking out the liquids, such as sap. Hemipterans do not have chewing mouthparts and any food source that is going to be ingested has to be in liquid form. Essentially, all hemipterans have a piercing rostrum or labium that is in distinct segments. The sucking mouthparts are formed from tubular structures called stylets that are modified from their use in other insects groups, where they surround the jaws. In hemipterans, the stylets of the mandible, or lower jaw, are serrated and surround the stylets of the maxilla, or upper jaw, which are smooth and are longer. The serrated mandibular stylets help to cut into the feeding substrate, while the smooth maxillary stylets are then pushed further into the substrate to such the liquid into the insect. In addition, these modified structures include a pump for sucking, a precibarium for tasting, and muscles to operate the pump. And the smooth maxillary stylets release saliva with enzymes that help to partially digest the food source so that it can be in the form of a "soup" for sucking into the insect (Martin and Webb). The name "Hemiptera" is from the Greek hemi ("half") and pteron ("wing"), referring to the forewings of many hemipterans, which are hardened near the base, but membranous at the ends. These wings are termed hemelytra (singular: Hemelytron), by analogy with the completely hardened elytra of beetles. They may be held "roofwise" over the body, or held flat on the back, with the ends overlapping. The hindwings are entirely membranous and are usually shorter than the forewings. The antennae in Hemiptera are typically five-segmented, although they can still be quite long, and the tarsi of the legs are three-segmented or shorter (Foltz 2003). Although hemipterans vary widely in their overall form, their mouthparts, formed into a rostrum, are quite distinctive; the only orders with mouthparts modified in a similar manner are the Thysanoptera and some Phthiraptera, and these are generally easy to recognize as non-hemipteran for other reasons. Aside from the mouthparts, various insects can be confused with hemipterans, including cockroaches and psocids, both of which have longer many-segmented antennae, and some beetles, but these have fully-hardened forewings, which do not overlap (Chinery 1993). Hemipterans range in size from 1 millimeter to around 15 centimeters (CSIRO). Hemipterans are hemimetabolous insects, meaning that they do not undergo complete metamorphosis or "holometabolism," in which the larvae differ markedly from the adults, but rather the larvae resemble the adults somewhat. That is, the young have compound eyes, developed legs, and wing stubs visible on the outside, but the juvenile forms are smaller and, if the adult has wings, lack wings. In this mode of development, there are three distinct stages: the egg, nymph, and the adult stage, or imago. These groups go through gradual changes; there is no pupal stage. The final transformation involves little more than the development of functional wings (if they are present at all) and functioning sexual organs. Hemiptera is the largest insect order that is hemimetabolous; the orders with more species all have a pupal stage (Lepidoptera, Coleoptera, Diptera, and Hymenoptera). Many aphids are parthenogenetic during part of the life cycle, such that females can produce unfertilized eggs, which are clones of themselves. Most hemipterans are phytophagous, feeding on plant sap. Such plant feeders include aphids, scale insects, cicadas, and others. Most of the remainder are predatory, feeding on other insects, or even small vertebrates. A few, however, are parasites, feeding on the blood of larger animals. These include bedbugs and the kissing bugs of the family Reduviidae, which can transmit potentially deadly Trypanosoma infections (Martin and Web). Several families of Hemiptera are water bugs, adapted to an aquatic lifestyle, such as the water boatmen and water scorpions. They are mostly predatory, and have legs adapted as paddles to help the animal move through the water. 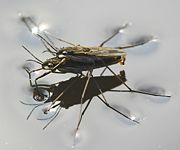 The "pondskaters" or "water striders" of the family Gerridae are also associated with water, but use the surface tension of standing water to keep them above the surface; they include the genus Halobates which is the only group of insects to be truly marine-pelagic, found on patches of flotsam in the open ocean (Martin and Webb). The present members of the order Hemiptera were historically placed into two orders, Homoptera and Heteroptera/Hemiptera, based on the differences in wing structure and the position of the rostrum. These two orders were then combined into the single order Hemiptera by many authorities, with Homoptera and Heteroptera classified as suborders. The Hemiptera order is presently more typically divided into four or more suborders, after it was established that the families grouped together as "Homoptera" are not as closely related as had previously been thought. Four orders are commonly recognized: Auchenorrhyncha, Coleorrhyncha, Heteroptera, and Sternorrhyncha (ITIS 2006). Auchenorrhyncha contains the cicadas, leafhoppers, treehoppers, planthoppers, and froghoppers. The 12,500 species in the suborder Sternorrhyncha are the aphids, whiteflies, and scale insects. The suborder Coleorrhyncha (comprising the single family Peloridiidae), contains fewer than 30 species of Gondwana-distributed bugs, and is sometimes grouped with the Heteroptera (to form the suborder Prosorrhyncha). Heteroptera itself is a group of 25,000 species of relatively large bugs, including the shield bugs, seed bugs, assassin bugs, flower bugs, and the water bugs. The closest relatives of hemipterans are the thrips and lice, which collectively form the "Hemipteroid Assemblage" within the Exopterygota subclass of the Class Insecta (TLWP 1995). 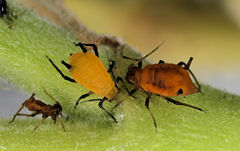 Many species of Hemiptera are significant pests of crops and gardens, including many species of aphid (such as whitefly, greenfly, and blackfly) and various scale insects. The later includes the cottony cushion scale, a pest whose infestation of American citrus crops sparked one of the earliest biological pest control programs, when the Australian beetle Rodolia cardinalis was introduced as a natural enemy of the scale insect (Green 2003). Conversely, some predatory hemipterans are themselves biological pest control agents, such as various nabids (Mahr) and even some members of families that are primarily phytophagous, such as the genus Geocoris in the family Lygaeidae (Hagler). Other hemipterans have positive uses, such as in the production of the dyestuffs cochineal and crimson, or shellac. Chinery, M. 1993. Insects of Britain and Northern Europe, 3rd edition. HarperCollins. ISBN 0002199181. Commonwealth Scientific and Industrial Research Organisation (CSIRO). n.d. Hemiptera: bugs, aphids and cicadas. CSIRO. Retrieved October 19, 2008. Foltz, J. L. 2003. ENY 3005: Families of Hemiptera. University of Florida. Retrieved October 19, 2008. Green, D. L. 2003. Cottony cushion scale: The pest that launched a revolution in pest control methods. Gardenbees. Retrieved October 19, 2008. Hagler, J. n.d. Geocoris spp. (Heteroptera: Lygaeidae). Bigeyed bug. In C. R. Weeden, A. M. Shelton, and M. P. Hoffman, Biological Control: A Guide to Natural Enemies in North America. Cornell University. Retrieved October 19, 2008. Integrated Taxonomic Information System (ITIS). 2006. Hemiptera Linnaeus, 1758. ITIS Taxonomic Serial No. : 103359. Retrieved October 19, 2008. Mahr, S. n.d. Damsel bugs. University of Wisconsin, Madison: Department of Entomology. Retrieved October 19, 2008. Martin, J., and M. Webb. n.d. Hemiptera: Its a bug's life. Natural History Museum. Retrieved October 19, 2008. Tree of Life Web Project (TLWP). 1995. Hemipteroid assemblage. Bugs, thrips, and lice. Tree of Life Web Project, version 01, January 1995. Retrieved October 19, 2008. This page was last modified on 20 October 2008, at 14:10.